A project of the Issaquah Historical Society, the initial phase of the Issaquah Valley Trolley Project introduced weekend trolley rides in Issaquah during an 18-month period during 2001-02. 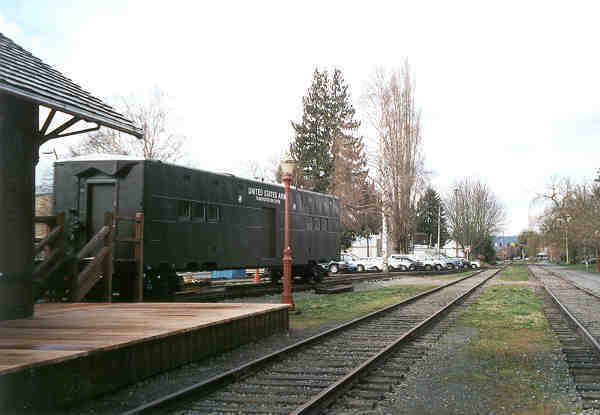 The trolley operated over about one mile of the former Burlington Northern rail line that passes through the heart of Issaquah’s downtown, with the city’s restored railway depot serving as the terminus. An emerging suburb of Seattle, Issaquah is suffering from the same congestion problems that have plagued other former rural villages turned suburbs. The complete build-out of the trolley plan, which would be a two-mile operation from the boat launch entrance to Lake Sammamish State Park, is seen as a way to help alleviate the shortage of downtown parking and begin to address general peak-hour immobility. History: When the track was taken up from the abandoned BN line in 1998, the City of Issaquah was successful in its efforts to keep the rails in place on the section through town. Local streetcar boosters also pooled their resources and purchased two miles worth of track materials from the salvage company that was removing the line. In July 1999, the City negotiated an outright purchase of the short section of in-town track and right-of-way from the Land Conservancy of Seattle-King County. The remainder of the right-of-way is being “rail banked”, and will be transformed into a public trail, with the possibility of reversion to rail use held for the future. Simultaneously, IHS began a search for a suitable trolley car. 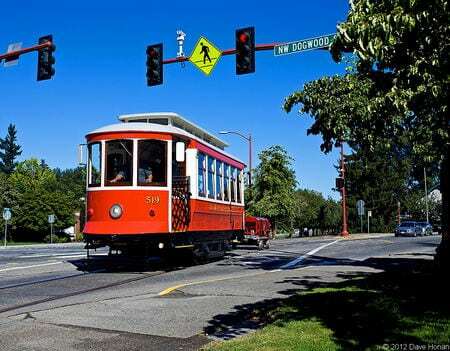 They were able to locate a single-truck Portuguese car in Yakima, Washington, where trolley operations had been idled. The car was leased to Issaquah for a period of 18 months. The group began weekend operations in May, 2001 and operated the car using a tow-behind generator for power (there is no overhead wire). A carbarn was also built to house the car. The Yakima car was returned in 2002, and the group subsequently acquired two other cars in order to once again offer the community an operating trolley. 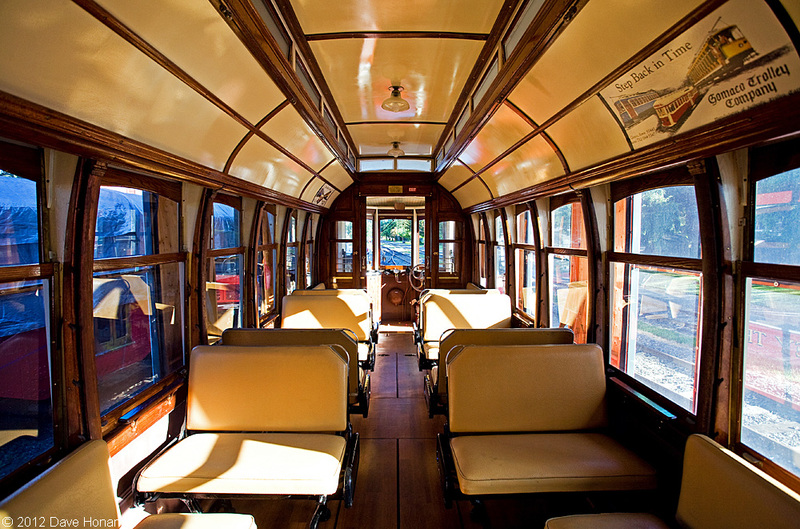 In November 2011, a contract was awarded to the Gomaco Trolley Company to restore one of these cars. The job was completed in August 2012 and the car returned to Issaquah for testing. Service is scheduled to begin in October 2012. Subsequent phases of the trolley project call for extension of the line the two miles to the boat launch entrance to Lake Sammamish State Park. When the rails were pulled out in 1998, the scrapper donated the crossing signal equipment, which has been left in place along this section of the line. IHS and the City are also studying how the trolley might fit into other regional transportation plans. IHS has a very nice web site, including details of the trolley operation along with plans for future expansion. being tested in Issaquah, August 2012. Dave Honan photos. in 2001 using car borrowed from Yakima WA. August 2012- The city’s trolley has returned from rebuild at Gomaco Trolley Comapny. November 2011- The Issaquah City Council has awarded a $750,000 contract to the Gomaco Trolley Company to rebuild an ex-Lisbon single truck streetcar for operation on the city’s vintage trolley line. 7/21/10 Update- Work is still underway to prepare for track rehabilitation and vehicle restoration. 1/1/09 Update- For the last two years, the Issaquah Valley Trolley Project has had $500,000 in federal funds earmarked, but was without a way to tap into the funds. That changed in December when the Issaquah City Council voted unanimously to designate the city as the certified acceptance agency for the project. 9/30/05 Update- Craig Thorpe reports the favorable news that the Issaquah Valley Trolley Project received a $200,000 earmark in the recently approved federal transportation bill. An additional $300,000 in funds are also being sought by the group. the monies to be used for completing the rebuild of car 519, track repairs, repairs to the bridge over Issaquah Creek, and crossing protection upgrade work. 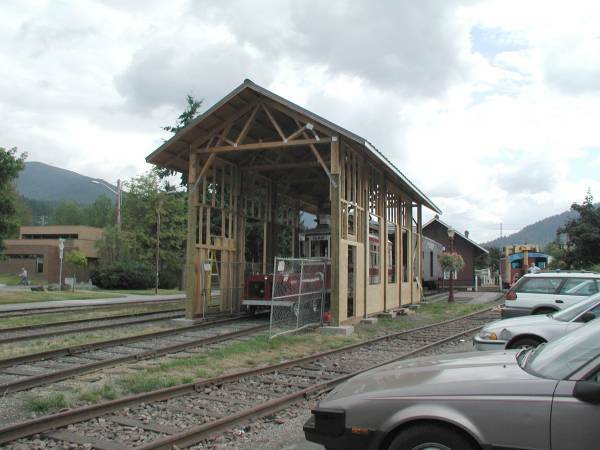 5/30/03 Update: Issaquah Valley Trolley’s recently-purchased Italian interurban car arrived on May 22nd. The group continues to work on fundraising, anticipating restoring one or more of the three cars now on the property in order to resume operations. Additional information is available on the group’s web site. 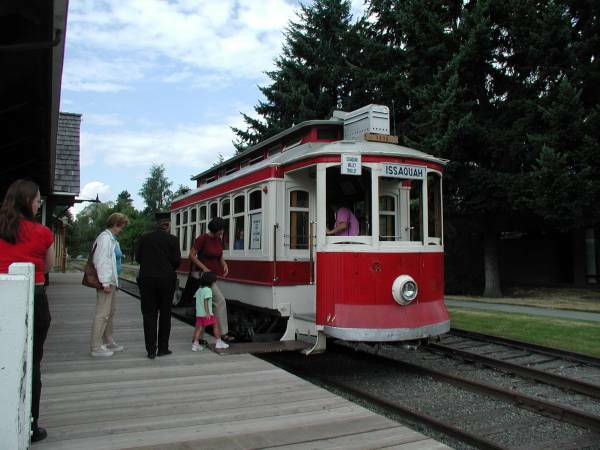 5/7/02 Update: The Issaquah Historical Society is preparing to return the trolley it has leased from Yakima, Washington since early 2001. 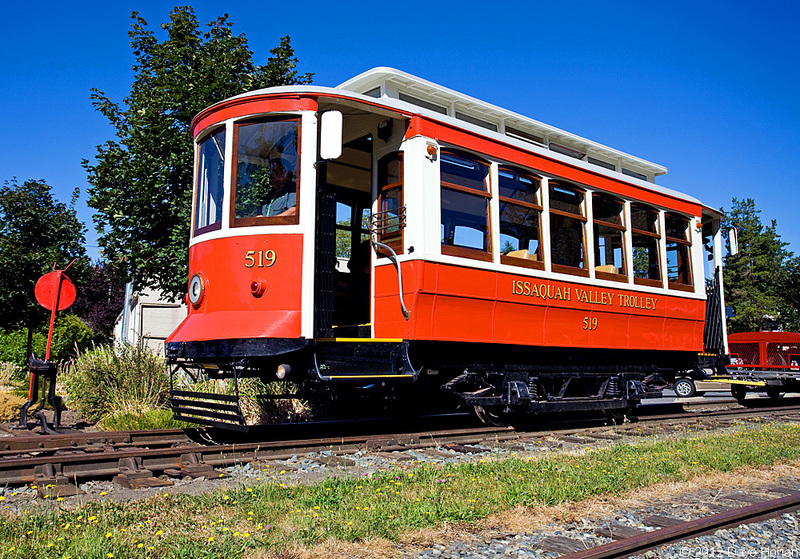 The 18-month lease of the car permitted the Issaquah Trolley to move from the concept stage to a successful inaugural season. With the car’s impending return, IHS has begun a search for a replacement trolley. The Seattle Times ran a nice article on these recent events in the April 20 edition. 8/02 New Trolley Purchased: Issaquah Valley Trolley is in the process of purchasing a 1930’s Italian interurban car from San Francisco. The steel-bodied, double-truck car was operated in Milan until the 1980s, when it made the journey to San Francisco for use in that City’s historic streetcar operations. Unused in San Francisco, the car has now found a happy home in Issaquah. The group plans to have the car ready for service in the Spring of 2003.